During spring and the very beginning of summer, Chicago has had some angry weather. The heat and humidity have been extreme. And it seems that thunderstorms pass over the metropolitan area every other day during the afternoon rush hour. When we have had some nice days, they have been good enough to take advantage of some al fresco dining. 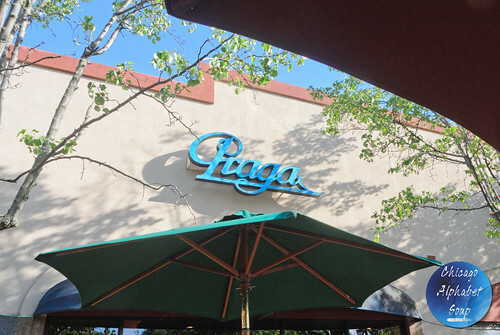 I managed to squeeze in a day of some patio dining at Praga/Bonton in Lombard, Illinois, at 229 W. St. Charles Road to see how they tempt the palate. Only wanting a sampling on the first visit, I settled on two courses. The first was a lobster ravioli. While I have had more than my share of lobster ravioli at various Italian restaurants, it is always a plus when you get a dish that leaves you wanting more. The cheese inside of the ravioli had a la tur texture, very creamy and rich. The lobster chunks were not mere hints, which was all the indication I needed to know that there was neither imitation nor essence stuffed between the pasta. Topped with a corn and bell pepper confetti, this moved up to the top spot as best lobster ravioli that I have had in Metro Chicago. The second dish was a risotto with diver scallops on top. My favorite Italian osteria in Logan Square serves the absolute best diver scallops risotto that I have had to date, but the dish at Praga/Bonton is a very close second. Filled with mushroom, asparagus, and wild truffle sauce, I recommend this dish. It pops with flavor without being busy on the tongue. Get a bowl for yourself, as sharing may result in too much of it going fast and regrets for not being selfish. For my second visit, I wanted to try a few other dishes that were more French. The offerings that I had the first time were very much couched in Italian and authentic in flavor, so I was curious to see if there was a proper amount of respect paid to the French menu items. They scored high marks in that space. Veering away from escargot, since that is such a common item on menu items, I started with a bowl of forest mushroom soup, laced with sherry. Again, dining al fresco, it was rather hot outside, but the soup was not one that left me lethargic from being heavy combined with the outdoor heat. Packed with flavor from fresh mushrooms and a savory cream base, I polished it off and then used the complimentary bread to go around the inside and bottom of the bowl, sopping up as much of the rest of the soup as possible: Clean Bowl Society. The second course was a crab cake atop an avocado papaya chutney and arugula salad with an avocado vinaigrette. The bliss factor for the crab cake was that there was very little breading used, more dusting than anything. The crab cake was another dish packed with flavor without having one wonder if the chef was trying too hard to season the dish. You could taste a bit of the sweetness in the crab meat since it was not masked by an unnecessary melange of herbs, seasoning, and other spices. The bed of vegetables reminded me of crudites, which is a small side dish of julienne vegetables (e.g., carrots, cucumbers, bell peppers) that many in France enjoy. 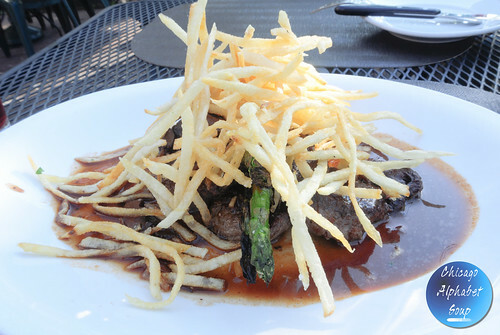 The third dish was a plate of beef medallions under frites. The chef erred on the side of preparing the beef tenderloins medium well and I was appreciative. The meat was neither runny nor was it charred to an unappetizing crisp. It was just right and whatever seasoning used to marinate the meat gave it enough smack without a need for any additional seasoning help. Add to that the Cognac flambe and the tenderloins having been sauteed in Bordelaise sauce with wild mushrooms, along with grilled asparagus spears, the marriage with the frites made it delectably French. The finale was a duo of chocolate mousses, one white chocolate, the other dark chocolate. Served with a berry compote and looking like two scoops of ice cream, each scoop was heaven. The white chocolate was not sugary and the dark chocolate was not milk chocolate. This was a perfect ending to three prior courses that were already mouthwatering. Needless to say, the output from the kitchen was absolutely winning. The table service is also outstanding. My server during the first visit was quite conversational and good about making recommendations. 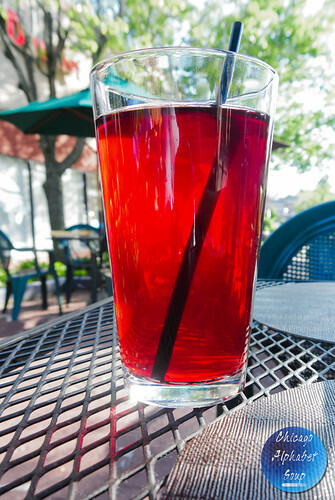 On the second visit, the server remembered me, minus my 6-inch beard that I had shaved, where I sat, what I ordered, and my preference for cranberry juice. Service is everything and Praga/Bonton sets the bar high for creating a welcoming environment. The menu is a mix of Italian, French, and German-Austrian, but still retains authenticity in each without compromising recipes. If you are ever passing through the downtown Lombard area and wondering about dining options, add Praga/Bonton to your list. Now that I have been on assignment in the West Suburbs, I had been actively looking for some restaurants in that vicinity with an international appeal that I could sample for blogging. The farther away you are from Chicago proper, the more limited the options are in that space. 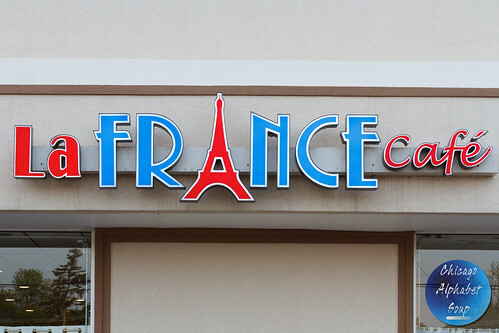 Imagine my surprise when I discovered La France Café & Crepes at 708 S. Main Street in Lombard, Illinois. I went with my restaurant advisor on a Saturday and we arrived shortly after they had opened for the second part of the day. First thing we noticed was the accommodating service. It was a small touch, but the greeting of “Bon soir,” was enough to set a tone of comfort that we were both okay with. For me, being fluent in Quebecois and conversational in Creole meant not fumbling for words or feeling out of place whenever certain French words were used during our dining excursion. 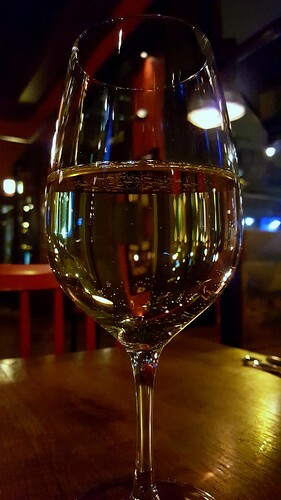 While perusing the menu, my advisor started with a glass of Pinot Noir and I had an iced mocha, after which I decided to have a Beaujolais once I had something to eat. On to the good stuff. We ordered three savory crepes and two sweet crepes. 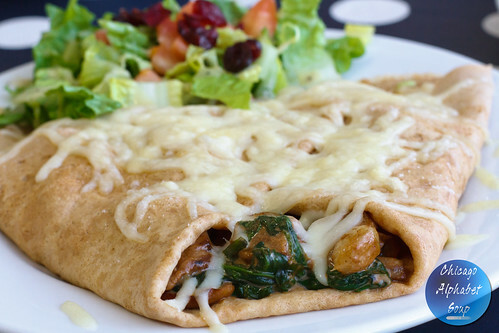 The beouf et a l’abricot crepe reminded me of Moroccan tagine but stuffed inside of a crepe. 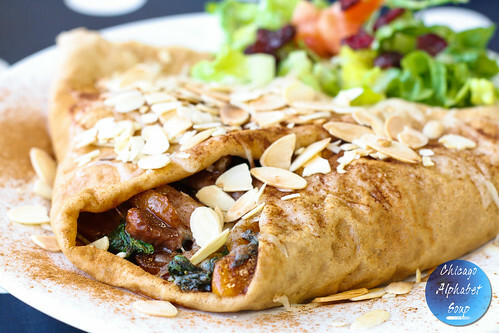 Filled with tender beef, apricot slices, and spinach, and topped with toasted almond slivers, this was just what I needed to put me in mind of being back in Morocco. The beouf bourguignon was the equivalent of beef bourguignon as a stew reduced so that it could go into a crepe without making the crepe soggy. Filled with pearl onions and plump mushrooms, we loved it. The crepe de saumon a l’estragon was my favorite. This was stuffed with salmon that had a mild kick, red onions, tarragon, tomatoes, spinach, and crème fraiche. The seafood lover in me indeed approved. 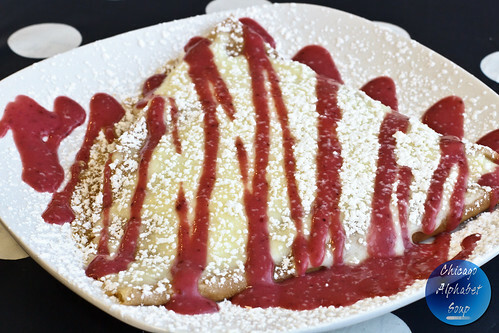 One of the sweet crepes was a framboise citronnee, which was filled with lemon custard, drizzled with a raspberry sauce (not from a jar), and sprinkled with confectioners sugar. Each bite was like summer on the palate. 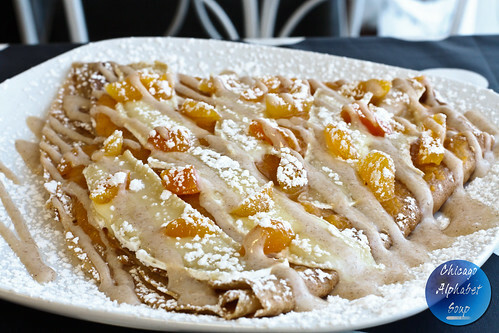 The other crepe was a abricot et brie, a true sweet and savory crepe thanks to the apricot purée and brie, while topped with candied apricots and dusted with confectioners sugar. 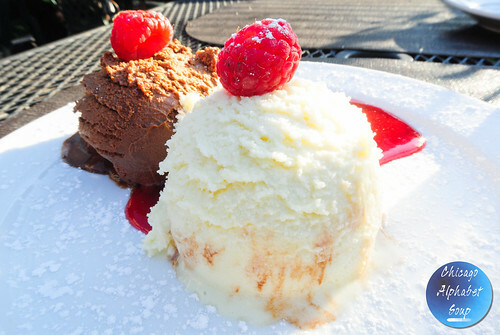 Instead of going with whipped cream on the top, we had a fist size scoop of ice cream on the side. 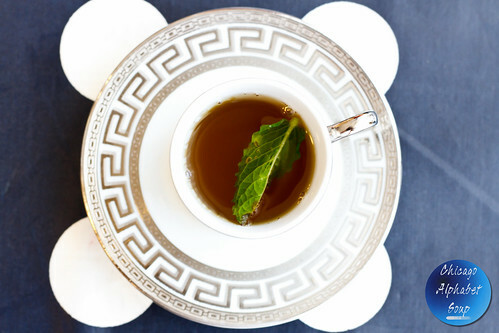 And we finished with Moroccan mint tea, yet another trigger to make me miss my vacation in Morocco. One thing to note is that nothing comes to the table within five minutes, except maybe the complimentary water, a coffee, or a glass of wine. The crepes are made to order, so there is no rush of any of the crepes to the table within five minutes. If you go to a creperie and you get your crepes in a flash, I highly recommend that you run. The crepes at La France Café and Crepes do not have a spongy texture, but rather that of a flat-pressed pancake. This is good because crepes in non-touristy France are prepared accordingly. Well, they reminded me of the ones I had in cafes during my days in Chalon-sur-Saone. For my restaurant advisor and me, there will be repeat visits. Pour de vrai. Recently, I have been in a bit of a French mood. 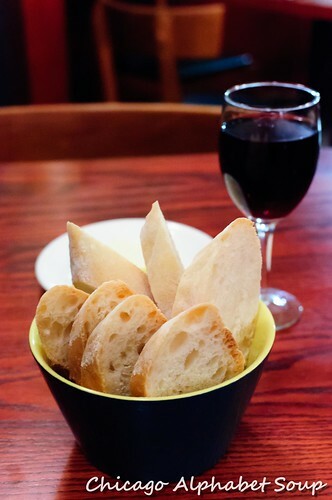 For the longest I had been searching for restaurants that had a basque feel, and without the churn of a crowd. Like in France, one can enjoy a meal alone or in small company in some bistros and cafes without an excess of ambient noise and people crowding your space. My restaurant adviser and I had culled together a list of restaurants that we thought would be good samplers. First on our list was Cafe Des Architectes in the Gold Coast Sofitel Hotel at 20 E. Chestnut Street. 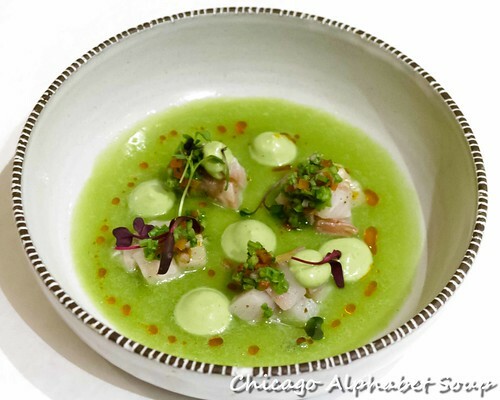 Just west of the Magnificent Mile is this fantastic restaurant that’s surrounded by swanky clothing boutiques and other very appealing restaurants. Located off to the side of the lobby is this very spacious, airy, and well-lit restaurant that also has a large outdoor seating area. With weather being extremely nice for October, we sat outside during our first visit to enjoy the moderate temperatures and to watch people in their comings and goings. 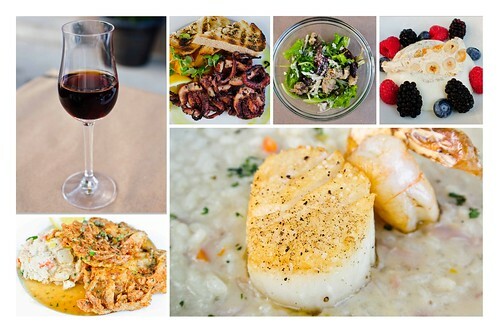 Opting for small plates, we ordered from the appetizer section with a pescatarian focus. Starting off was a l’amuse of trout croquette atop an aioli and the first of three pairings, a champagne that neither nipped at the back of the jaw nor left a pucker on the front-end of the sip. Seasoned well and void of an excessive amount of breading, the bite size trout was still meaty and the aioli was not the least bit overpowering. The Maryland style crab cakes were a reminder of why those are a favorite. Served with a chipotle aioli, citrus segments, and an avocado purée, there was not a crumb of breading on the crab cakes, which meant we got to enjoy seasoned, fresh crab to the fullest. Following with the hearts of palm, which came with a cauliflower custard, radicchio, and caviar, it was evident that the restaurant was going for full flavor even with small plates. And then we had the chilled summer squash soup with a nice smear of mint yogurt, curry oil, and granola. While most may be accustomed to a hot soup, this is the epitome of a summer soup, best served when it’s very hot outside, enjoyed regardless of when the temperatures are warm enough for patio dining. Getting more into pasta, we had escargot pappardelle. Accented with a garlic cream, parsley, and parmesan, the plump escargot popped with each bite in this light pasta dish. 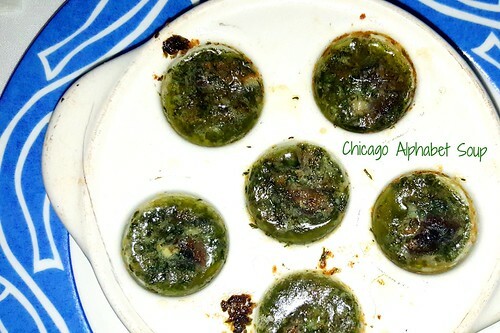 Unlike when escargot is served in a bubbling pesto, there still was enough of the garlic cream in the dish to remind you of how delicious the delicacy is. Wrapping up the many landings with black truffle and corn ravioli with rock shrimp, pancetta, and parmesan, we acknowledged that we had no room for a cheese board as a dessert. The ravioli was also light, but still it was filling without leaving us overly stuffed. Paired with a pinot noir, this was perfection on the palate. The finale was espresso that was clearly made from a fine bean. While my restaurant adviser was sharing a few chocolates from Veruca Chocolates, we received complimentary sweets of mango macarons and key lime wrapped in chocolate. Enjoying this with the coffee was superb, as the macaron was fresh and the chocolate was nothing like the blocks of chocolate you get from anchor stores at the mall. 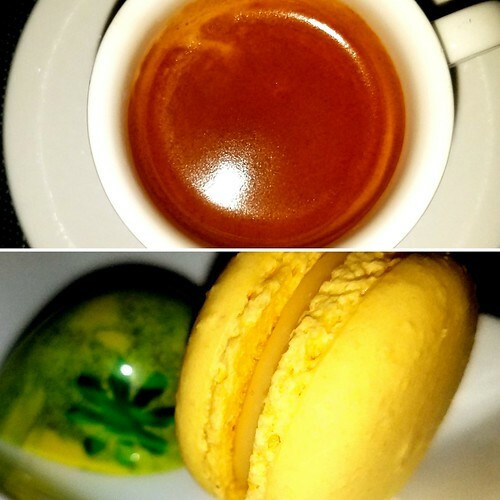 The key lime was creamy, the white chocolate, which had been decorated to look almost like a precious stone, was outstanding, and it all went well with the espresso. The first visit was noteworthy given the appreciation for the quality of the food and the attentiveness of the service. So, we indeed had a return visit. 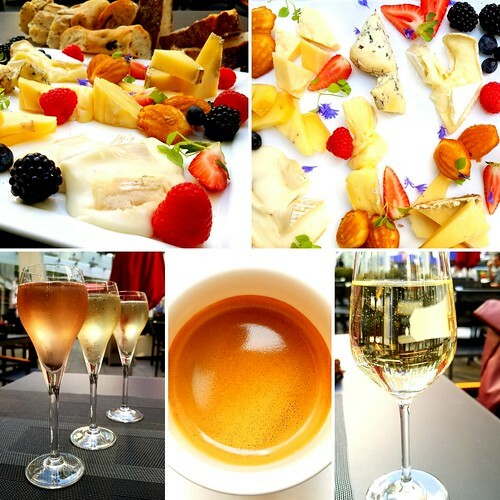 Having enjoyed a nice selection of small plates during the première visite, we settled specifically for wine and cheese, champagne and cheese for my adviser. Yet another day with perfect weather, we had an outdoor seat and settled on a selection of soft mild, semi-firm, and one firm cheese. 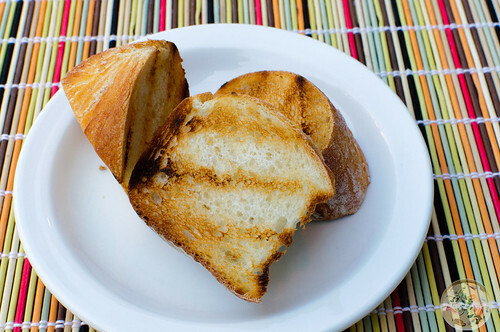 The creamy and buttery fromages of Edel de Claron, Tallegio, and Brie St. Rocco worked well on sourdough. The Fourme d’Ambert, Morbier, and Tomme were semi-firm enough to enjoy on the olive bread that came with the cheeses. The Cantalet was just right for enjoying with the multigrain bread. And for even more enjoyment, the summer berries and miniature madeleines were exactly what we needed to mentally go back to France. Of course, there was no way of departing without taking an espresso. Cafe Des Architectes has a very laid back feel. There was no rush, which is a rather appealing touch to a restaurant because good food should be savored. Cafe Des Architectes does a fabulous job making your visit the first of many. The closest I will get to France this year will be via a rendezvous in Paris en route to Morocco. In the meantime, I am enjoying this bit of France in Chicago. 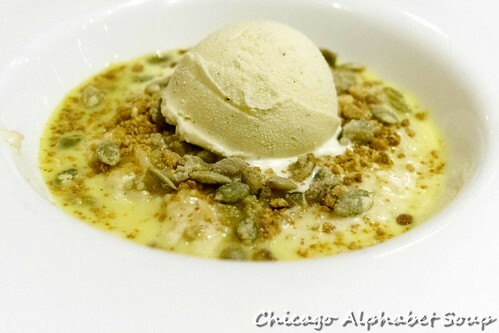 Several years ago, a colleague who discovered my love for food and blogging about it had recommended a French restaurant in Chicago’s Ravenswood neighbourhood. Like some suggestions, I had entered it into my cellphone but never followed through. And when I did, finally, I discovered that the restaurant had moved closer to downtown. 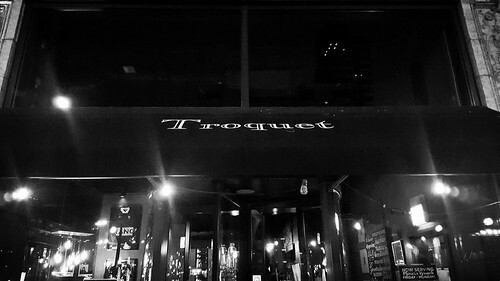 With Restaurant Week in full swing for Chicago, I saw a listing for Troquet, the restaurant that was once farther north, and that the restaurant was participating. So, it was off to 111 W Huron Street for a sampling. With this being my first visit, I was more of a curiosity seeker than someone wanting to try a long list of menu items. I settled on a few dishes that I figured would be a good introduction to Troquet and a way to gauge whether repeat visits were worthwhile. 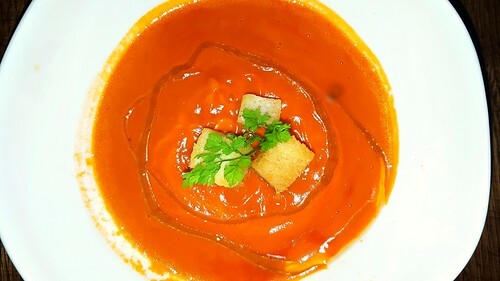 The first dish that I started with was a bowl of creamy tomato soup. This came in a deep bowl, topped with some croutons that tasted like nothing from the bags at market, and also accented with a drizzle of chili oil. 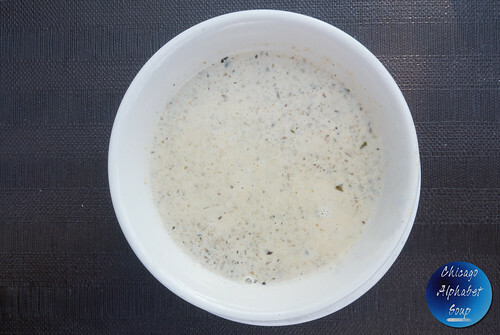 Before the first spoonful, it was apparent that this was not soup from a can, which some restaurants in the Chicago metropolitan area have sneaked out to tables. The chili oil didn’t overpower the base, yet it did provide a mild kick that made the tomato soup stand out as a favourite. 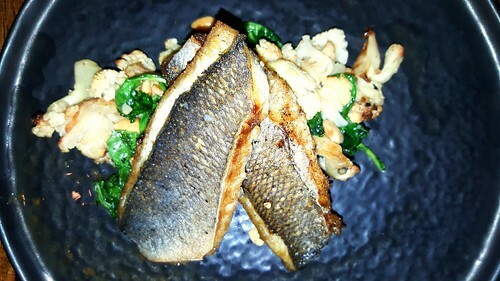 The second landing was a plate of dorade atop cauliflower, mushrooms, and spinach. Dorade was a curiosity menu item for me, being a lover of seafood, but having never had dorade. The texture was flaky with a faint note of silkiness. I initially thought that I had Chilean sea bass. The skin had been seared enough to have a bit of a crisp to it. However, the fleshy meat was succulent and bursting with flavour. The accompanying vegetables had been seasoned such that they were not screaming with salt or an excess of seasoning. This was a perfect landing. 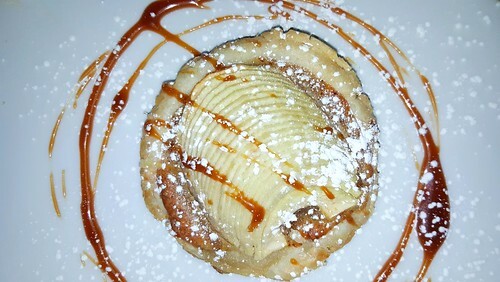 The finale was an apple tart. The apples, which had mild hints of tartness and were crisp, were sliced thinly and served atop a flaky pastry that wasn’t a victim of too much sugar. This was an indication of the pastry having been baked on the premises from scratch. To make the dessert that more better, the caramel drizzle tasted like caramel that had been prepared using sugar and butter in a skillet in the kitchen. Yes, it was homemade. It was not melted blocks of Brach’s caramel. Troquet is a spacious restaurant and surprisingly quiet. The interior gives off the feeling of a restaurant that was once a bar and has been repurposed. 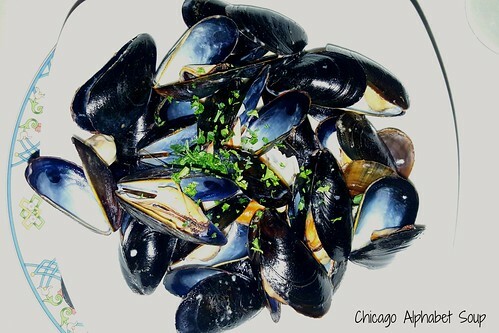 French restaurants in Chicago tend to have a bistro feel (casual) or a white tablecloth atmosphere (fine dining). River North boasts watering holes for those who love vibrant bar scenes. In the vein of French restaurants, Troquet is not a bar and while it’s not a pretentious place, the cuisine seems to stand out. 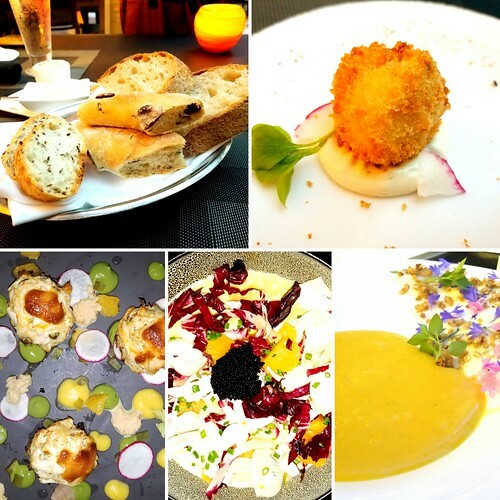 For a place with great service and outstanding French food, Troquet is worthy of countless return visits. After years of living in Chicago, I have been recalling a statement that an individual made when we had met in 1989. She had stated that you can spend your entire life in Chicago and never cover all of it. I have discovered that the same applies to some of the edge cities like Evanston, Rosemont, Schaumburg, Skokie, and Oak Park. Case in point was during a casual stroll a block north of downtown Oak Park where I stumbled upon The Little Gem Bar and Restaurant at 189 N Marion Street. Spacious on the inside with a bistro feel to it and also with some outside seating, there is an atmosphere of ease that doesn’t feed into ambient noises and acoustics all over the place requiring you to shout with your dining companions. Taking advantage of the outdoor seating, I settled on a four-course meal that had a French influence. Since the restaurant had been touted as a French bistro on Yelp and Google, I chose to stick with that theme, although I did see a paprikash dish on the menu, which is Hungarian. 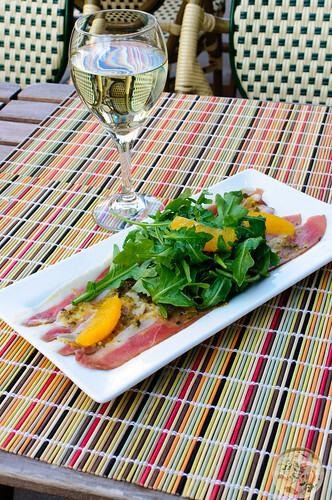 For my first course, I had a duck carpaccio with a salad in a light vinaigrette with mandarin slices. The server paired this dish with a Sauvignon blanc that had some fruity notes that balanced out the tartness of the duck carpaccio, which had strips of raw duck. Those who like tartar and the texture would certainly enjoy this dish. 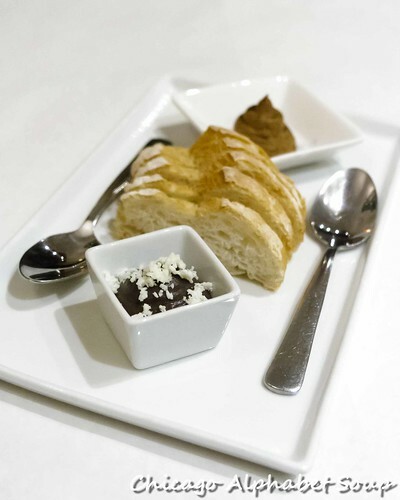 Because I had opted for a pairing of wines with each course, the server thought that it would be a good idea to have some bread for a palate cleanser, as well as an aid for reducing buzzing. I’m not really sure if the grilled toast was complementary, but I must admit that it was of the variety that I could go off the rails with while enjoying some gouda cheese. The next course was a plate of deviled eggs. Accented with parsley oil and a balsamic reduction and topped with crispy, fried onions and pickled jalapeños, all four that came were absolutely scrumptuous. Paired nicely with a Chardonnay that had a buttery and oak flavour that was light on the palate while not usurping the centre stage from the deviled eggs, I actually developed a better appreciation for deviled eggs, as I have not had any that weren’t abused by a use of too many herbs and spices. As of late, I have been introducing pork back into my diet, albeit in moderation. 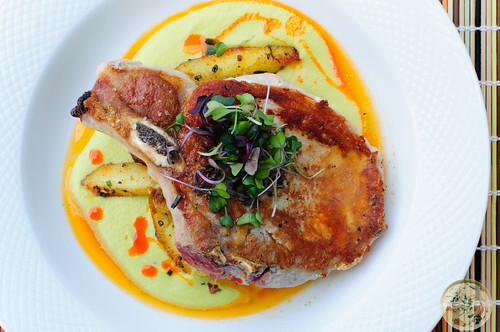 The server had specified the special for the evening, which was a 10-ounce bone-in pork chop in a jalapeño and apple purée with roasted potatoes sautéed in a Spanish chorizo. For the pairing, the server brought at Pinot noir that had a “right” amount of acidity to match well with the dish. For an individual who has not been a fan of pork for many years, this one was one I would rush back to the restaurant to indulge without pause. In keeping with the French effect in dining, I had cheese for dessert rather than a sweet. 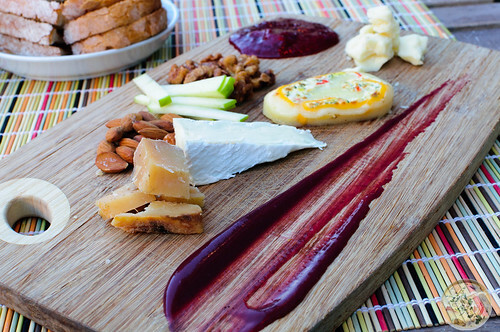 The cheese board came with an assortment of cheeses, housemade strawberry jam, smoked almonds, candied walnuts, and apples. There were aged Wisconsin cheddar, a brie, a housemade cheese, and a casabola. The housemade cheese was an interesting marriage of provolone, cheddar, and cream cheese. The caso bolo was a mixture of goat, sheep, and cow cheeses. Along with a cup of coffee, this was a delectable and ideal finale to what was a spectacular meal. I was somewhat expecting “regular” fare, but was thoroughly surprised and satisfied with the offerings. 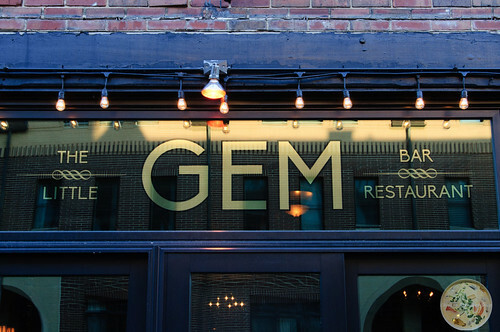 The Little Gem Bar and Restaurant is not French-specific. If I could apply a word to the restaurant, it would be Pan-European because of some Eastern European offerings and Mediterranean fare. One thing I have not done on the blog in years is name the servers that went well past outstanding. But Liz and Zach were two of the top servers any diners could have at their table. I understand why most at the restaurant were locals. Oak Park is not a local destination for me, but I have a feeling I will be a regular at The Little Gem Bar and Restaurant. With Chicago’s ongoing renaissance, The Loop is filling in more with restaurants that remain open past happy hour. I was surprised to find AraOn in a rather inconspicuous location at 160 W. Adams Street tucked between W Hotel and US Bank. Noting the moniker of Asian French Cuisine, I figured it would behoove me to see what the menu had that would make me okay with delaying going home for the evening. There is a big box feel to AraOn and I expected that given it’s location downtown. Some people are rather Better Homes & Gardens with their thoughts about restaurants, so they will love the decor. I like the fact that seats are not on top of each other which means you don’t have to compete with your neighbours to be heard during conversation with members of your own party. What matters to me most is if the main thing I’m paying for was worth it: food and/or drink. I am leery of fusion, especially when it comes to certain Asian cuisines blending with European or South American flavours where there was no influence per Asian migration. I must admit that AraOn gets it right. For my first course, I started with a miso soup. This was the traditional preparation and there was nothing amiss with it. 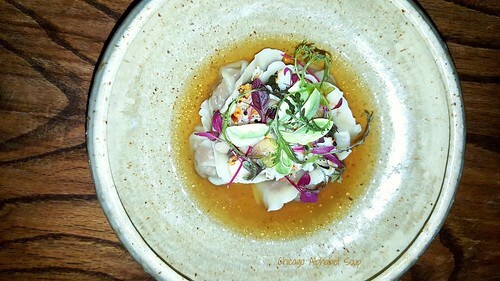 The second course consisted of duck dumplings that came with braised mustard greens, shrimp, and maitake mushrooms in a consomme of seafood-duck broth. This was the one dish that I noticed had a blend of Asian preparation with the dumplings blended with French preparation of the consomme. 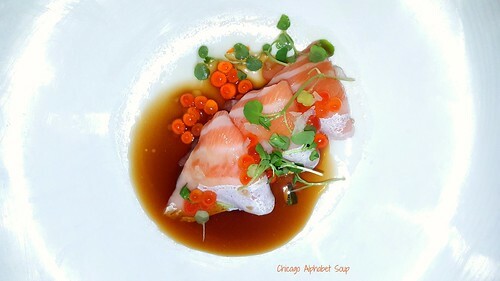 There was a brief l’amuse of sashimi salmon with roe atop a savoury gravy that I had not expected. Immediately after the first bite, I acknowledged that I could have indulged the dish as a regular course. The salmon was meaty without being oily and the “clean” flavour was an indication of having some of what was no doubt fresh catch seafood. 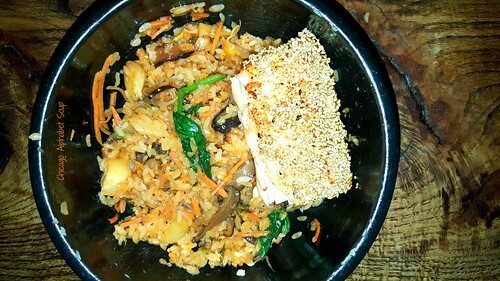 The third course was a clay bowl of sesame crusted salmon with bibimbap. Not only was the salmon bursting with flavour, but it was incredibly flaky while being succulent. I can’t state any French influence in this dish, but the bibimbap is my favourite Korean dish. Kimchee, bean sprouts, pickled shiitake mushroom, spinach, and braised beef short rib nicely sectioned off that I mixed with rice and a spicy pepper sauce made for a hearty dish that again reminded me of why bibimbap is indeed a favourite. I saved room for a fourth course of dessert. 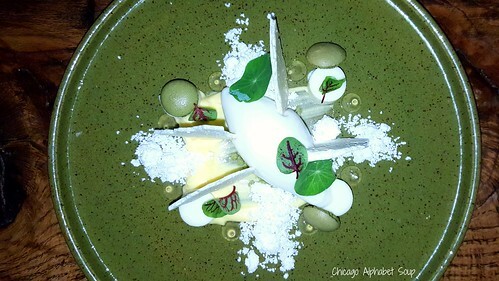 That came as matcha ice cream atop lemon custard with meringue crisps — so reminiscent of lemon meringue pie — and matcha macarons. The matcha was prevalent in the dessert, but not overpowering, which gave me an hint that loose leaf tea was used in the preparation. Small indicators like this wink at an appreciation for culinary arts because a quick dessert would have lacked in flavour sorely. The service at AraOn is winning. The food is also worthy of repeat visits. And for what tastes like fine dining, the prices are reasonable. I have to remember to switch into my British and Caribbean modes so that there is a stagger of 5-10 minutes between courses. There were overlaps during the courses. Add to that I paired wine with the dishes, there was a bit of a rush that resulted in me being sated too fast and buzzed. Understanding that it is not possible for restaurants in and around downtown to know when individuals prefer to dine with ease or with haste, I shall adjust my ordering technique accordingly in the future. I’ll order a course, hold the menu, finish dish, order next dish, and repeat for remaining courses. I shall return, so I’ll apply my method and again enjoy all the good things on the AraOn menu. 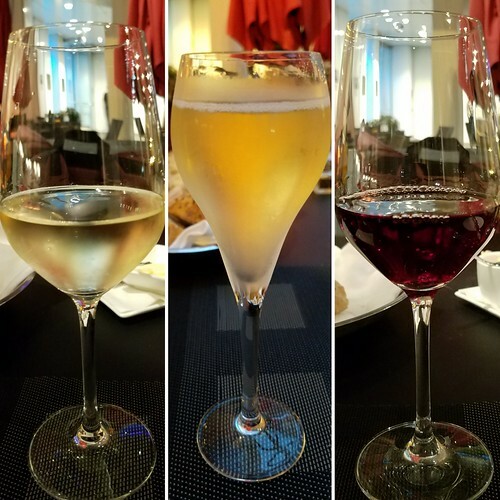 Several months ago the owner at my favourite Italian restaurant in the world, Osteria Langhe, recommended a French bistro to me since he knew that I liked the European feel to my dining experience. During my last visit to the Italian restaurant, I thanked the owner for his recommendation. He then offered a recommendation for another French restaurant that he was confident I would enjoy. My sister and I blocked an evening for a sampling and before going into the full review, I’ll just say that I will thank the owner at my favourite Italian restaurant for this most recent suggestion. 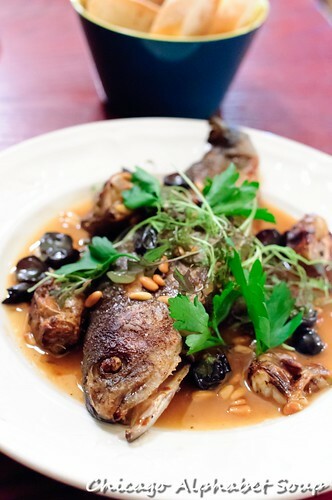 Located at 111 N. Carpenter Street in Chicago’s West Loop District is La Sardine. Come to find out that this restaurant is the sister location to Le Bouchon, which was the first French restaurant given to me as a recommendation. La Sardine is larger, less of a bistro, but without any doubt, the food is just as spectacular and the service is also top. Not being in a rush, my sister and I opted for a round of various dishes for fulfillment of our own little degustation. 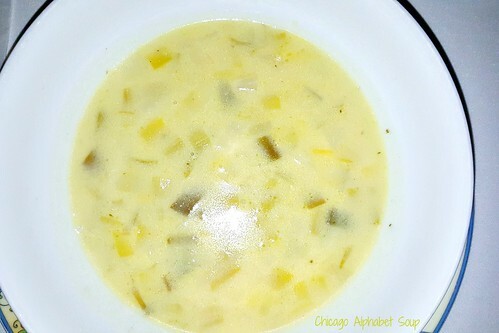 There was a potato leek soup that puts to shame some of the same soup that I have had at numerous restaurants worldwide. Unlike the thin base that I have had in the past, this was creamy without the potatoes being the thickening agent. Fresh ingredients in the recipe and this was a perfect starter. 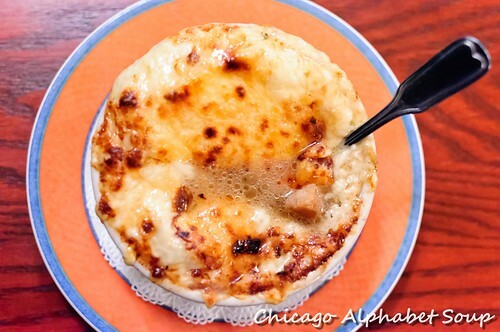 During my first visit to Le Bouchon, I had ordered the soupe à l’oignon gratinée. When my sister and I had returned for what was to be my second visit, she had not had the French onion soup, so it was a part of the meal for our La Sardine sampling. After cutting through the baked gruyère cheese and down through the crouton, she understood why I talked incessantly about how much of a fan I was of the soup. Midway through the soup, she declared that it was the best she had ever eaten. It would be wrong to go to a French restaurant and not partake of any escargot. So, we had a platter of plump escargots à la bourguignonne bubbling in burgundy, garlic, parsley, and butter. After we had finished the savoury morsels, we used the homemade French bread to sop the remaining sauce from the little cups on the platter. Sin entered the picture when the bowl of moules au cidre arrived at the table. Granted the morsels in the mussels are light, the quantity of mussels was not small. To add to that, the mussels were swimming in a delectable cream sauce accented with cider and shallots. After we finished the mussels, we then used the French bread to sop the rest of the sauce. My sister, being a Catholic, spoke to an invisible priest, “Forgive me Father, for I have sinned.” Me being a practising Buddhist, simply acknowledged that I was enjoying the moment of gluttony and decided to be at peace with my higher power after coffee. For my main dish, I ordered the rãble de lapin. The rabbit was delectable, tender, not oily, and nothing akin to gamey on the palate. Served with a potato risotto in an au jus, I had pretty much decided that I will spend quite a bit of time at La Sardine cleaning plates. My sister ordered the magret de canard. This dish, one consisting of duck that was neither oily nor gamey, was a winner. 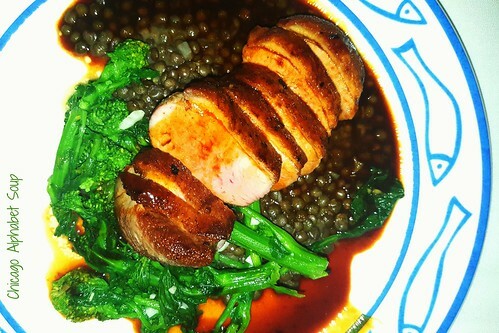 This one came with lentils and rapini in an addictive orange sauce. There were exaggerated pauses in conversation during the main course. I have a habit of humming when food is divine and my sister gets reticent for a few minutes. We were silent for at least fifteen minutes. There was no room for dessert. 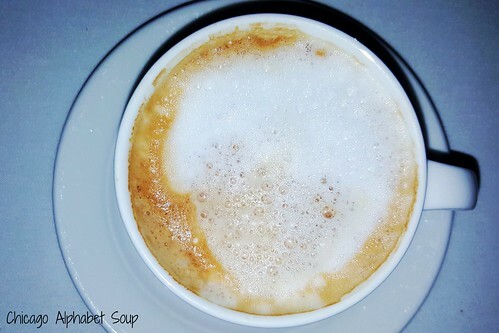 And although we watched some captivating sweets going to different tables, the most we could indulge was coffee. Coffee is the after-diner drink my sister always has and I opted for a cafe au lait. Quality bean, clean coffee machine, or whatever it may be, I can speak to the cafe au lait not requiring any sweetener and not making me feel like there was something bitter in the cup. The service at La Sardine is through the roof. The restaurant fills quickly and there is a nonstop flow of patrons coming and going. Still, it is evident that the service plays a part in the experience being splendid for those who come. The food is hands-down the best French food in Chicago that I have had as of late — and I include the sister restaurant Le Bouchon in the number one slot with La Sardine. Seating is close, a rather European effect, so be forewarned if you go. Make a reservation because the energy is high. Go on an empty stomach, don’t be in a rush to stuff yourself, and be prepared to experience sin with all the good flavours of France. 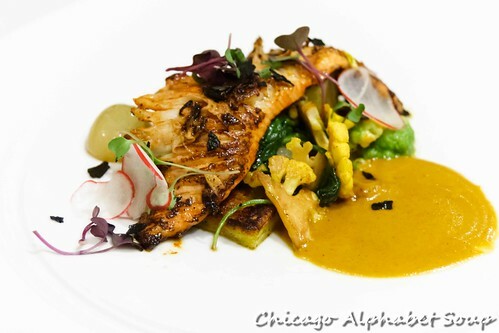 For the past few years, I have been going to a few restaurants in the West Town vicinity of Chicago. During the summer, I got to see much of the area while on foot. 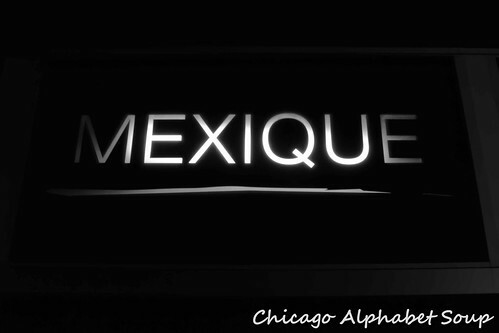 One restaurant I passed by several times was Mexique at 1529 W. Chicago Avenue. There was a “white table-cloth” feel to the restaurant and with that in mind, I never went in because I was usually in short pants and walking shoes. So, I decided that I would go one evening after work when I was better attired. I considered having the dining experience be more ala carte. And then I decided that I wanted a sampling of several menu items. The 6-course tasting menu was the better option. 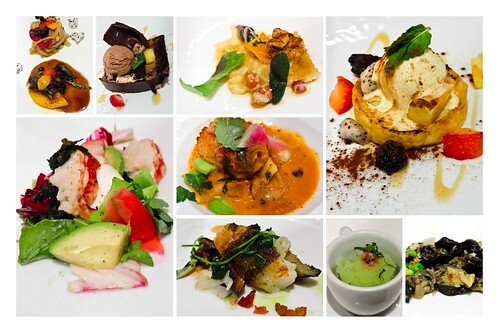 Having received the explanation that the food at Mexique is Mexican with a French influence, I knew that I couldn’t go wrong with a seafood approach to the tasting. While I waited for the courses to arrive, I had black bean purée and chicken pâté with French bread. 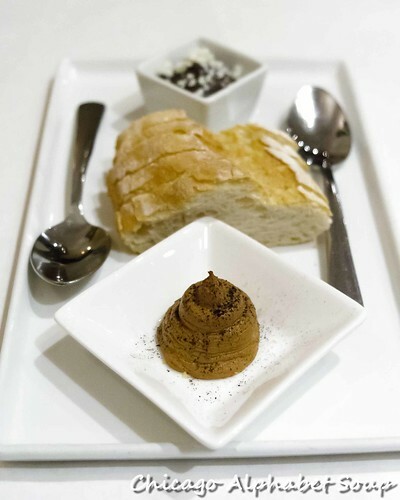 The black beans as a purée instead of thick frijoles was great for spreading as was the spicy pâté, both a great complimentary start and marriage between Mexican and French. The first course was poblano pepper soup accented with feta cheese, pineapple relish, quince, and celery root. The remarkable thing about this soup is that neither the spiciness of the peppers nor the sweetness of the pineapple relish overpowered the recipe. A white wine accompanied this dish, one with a lovely touch of sweetness. There were notes of peach and apricots in the wine. Smooth on the palate, it was splendid in the pairing in that it brought out the flavours of the soup rather than competing with it on the tongue. The second course was an interesting and addictive take on ceviche. 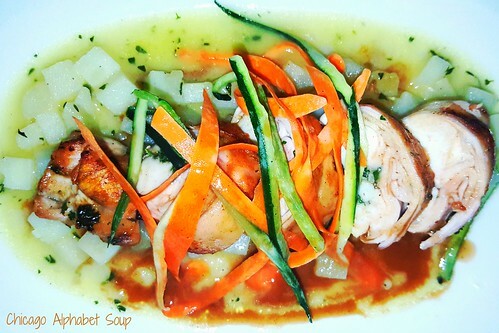 Cobia fish in citrus juice was the main seafood ingredient. 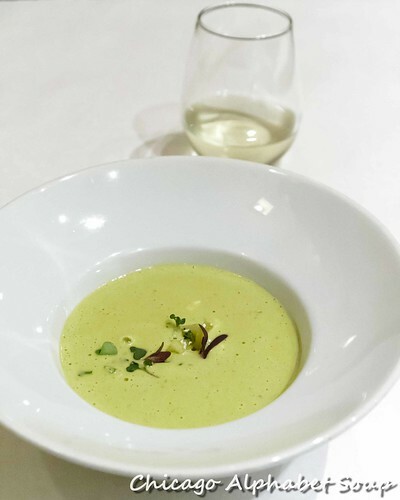 The French influence came in with the inclusion of the stock prepared with green vegetables, green chilies, also paprika oil and micro greens. 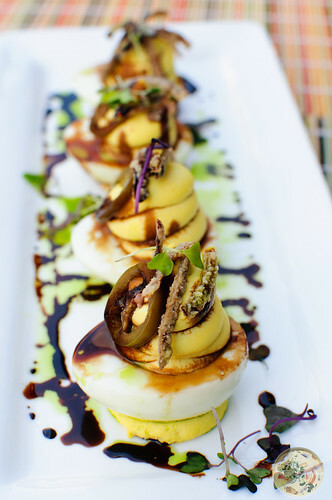 There were small dollops of poblana mousse that, once stirred in the ceviche, made the base slightly creamy. The wine that paired with this course was a Sauvignon Blanc from a vineyard in California. There was a high mineral aspect to it, a bit tart, that again allowed the ingredients in the ceviche to pop more than they probably would have had there been no wine served with the course. The third course was one that I initially flagged as the highlight of the evening after a taste of the first morsel. 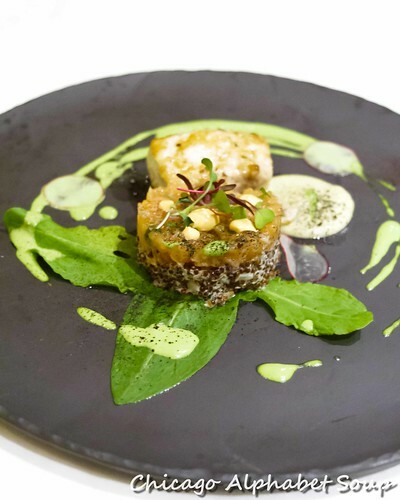 There was mahi-mahi in a lovely sorrel sauce and red quinoa with salmon tartar. The entire dish was drizzled with a burned onion aioli. 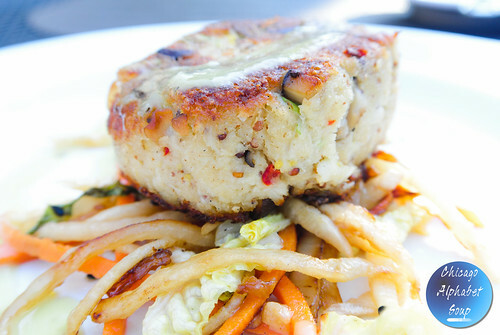 Those who enjoy seafood would love sampling the mahi-mahi and the salmon tartar. Paired with this was a crisp Spanish Rioja wine, consisting of fully ripe fruits, mainly grapes that played well with the flavours of the sorrel. Thinking that the third course was spectacular in terms of taste, the fourth course was unforgettable. 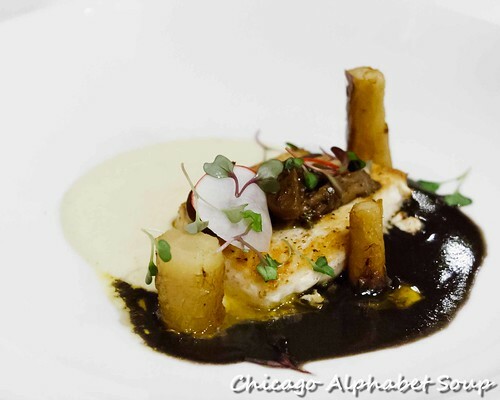 This was a whitefish with a black bean sauce prepared with a red wine reduction. The white potato purée had a surprising pop on the palate, as it was clearly not seasoned with salt and pepper only. Garnishes were baby carrots, confit style and micro greens. This course came paired with a Chardonnay. 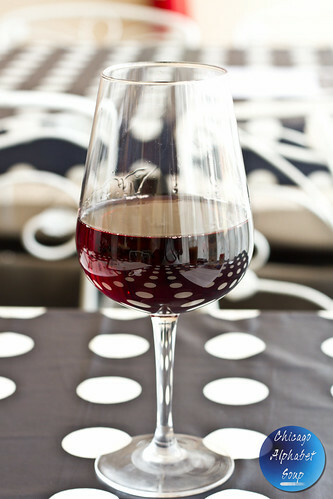 The complexity in this wine came in the form of ripe apples, vanilla, and oak. As if the whitefish wasn’t flaky and tender enough, the silky and buttery notes in the wine made the fourth course a culinary dream. Given each course was progressively better than the previous one, I should have known the fifth course would be a winner. This was another seafood dish, prepared with skate marinated in tequilla over spinach, cauliflower, and picked grapes, and set atop a fully ripe and compressed plantain. There was a nice amount of achiote seeds used for seasoning this dish and all of the ingredients were fantastic for letting each come through individually on the tongue. A French wine came with this dish. Medium bodied wine with notes of raspberries, strawberries, and blueberries, this was a perfect accompaniment for a dish that had so many complex flavours. The finale was one that I had to request a pause before having it arrive at the table. The prior dishes, albeit manageable, were slightly more filling than I had expected. I figured there would be a dessert that would be familiar, but perhaps rich. Sure enough, the arroz con leche with vanilla bean ice cream. This traditional Mexican dessert of rice pudding was enhanced with rompope, Mexican eggnog, and sprinkled with candied pumpkin seeds as well as white chocolate crumble. 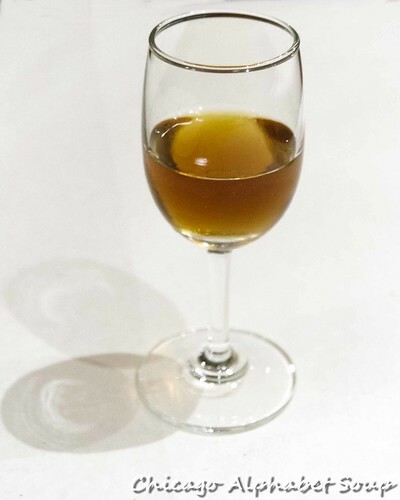 The dessert wine with the course was and Alameda. The figs, dates, prunes, and raisins in this sherry were fantastic, which made this wine a perfect match for the arroz con leche. Those who are expecting tacos, enchiladas, tostadas, and traditional Mexican fare may find Mexique a bit weird or lacking in purist techniques. 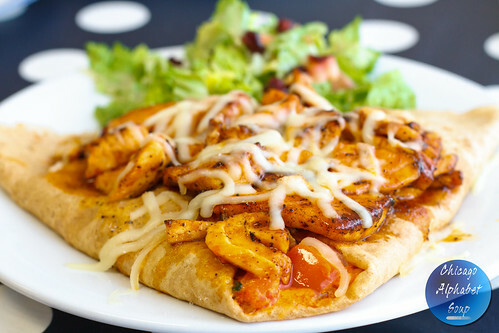 Even those who fancy Tex-Mex may not be okay with the cuisine either. This is not a restaurant that one may consider upscale Chipotle or a chic Mexican restaurant. Those who like variety and those with broad palates will find the ala carte and the tasting menus to be worthy of one or more visits. The sitting area is large, so there is lots of room for stretching out in preparation for dining. Make reservations, as the restaurant tends to fill up quickly. The constant influx of patrons is all you need to know that the food is good. Well, I’ve shown you pictures already. Now get ready for the taste. During a recent visit to my favourite, local Italian restaurant in Logan Square, the owner recommended a French restaurant in the vicinity. He was already aware that I love European style restaurants and cafes — small, quaint, boutiques where there is always good food, great conversation, and no such thing as a rush. And per the owner’s recommendation, I made a calendar entry to go to Le Bouchon at 1958 N. Damen Avenue in Bucktown. I arrived early enough to be difficult with my ordering. Having only a glance at the menu, I decided that I would not make the selections for what I wanted to eat, but I would instead let my server surprise me. There was my usual spiel that I primarily enjoy seafood and vegetarian options, and while I have no food allergies, I hate nuts; just bring something to the table and pair it with wine. While enjoying some homemade French bread, I waited. First to the table was French onion soup and a Pinot Noir. Now, given all of the French restaurants I have gone to, I never had a taste for French onion soup. This was my first. I have no benchmark for a good French onion soup, so what I had at Le Bouchon is what I will use to set my initial bar. 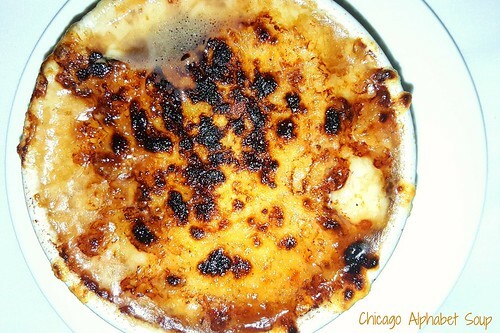 Flavourful broth without being overpowered by onions, topped with a large croton, and then topped with a gooey layer of baked cheese, I have a nod of satisfaction to a very appetizing start. The server thought I would enjoy the rushing waters trout. He was spot on. This was paired with a Chardonnay. The trout was de-boned and then reassembled. This came with pine nuts, which I have an allowance for, caper brown butter, mushrooms, and concord grapes. The beauty of the trout was not only in the bloom in the taste from the recipe, but also from the fact that the fish was so meaty. Those who may expect something creamy and rich may be surprised to find that the dish is rich without any cream. The finale was something different. 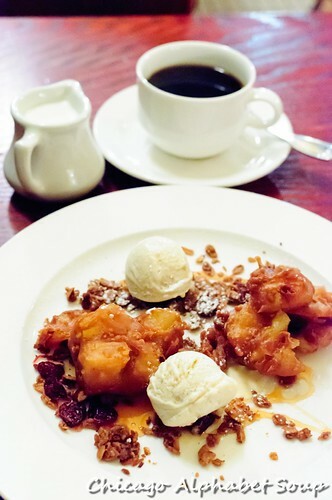 I had beignets stuffed with apple slices, served with svelte ice cream, granola crumble, raisins, and a cider reduction. Straying away from having cake or a heavier, richer dessert was a finer option since the starter and entrée were both filling. 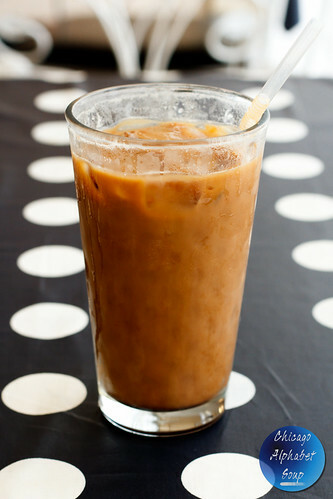 Having not inquired of the coffee, I think it was from some local, independent coffeehouse. There was no burnt or bitter taste and the only sweetener required was the cream that accompanied it. December has arrived and yet again I have the feeling that there is something that I did not do during the months of January to November. I did satisfy my resolutions for the year — getting my master bathroom remodelled, bringing my blood sugar level down, and engaging in regular exercise to shrink the tire that was around my waistline. What I did not miss throughout the year were delectable meals. And that brings me to my Top 10 Jaunts for 2014. 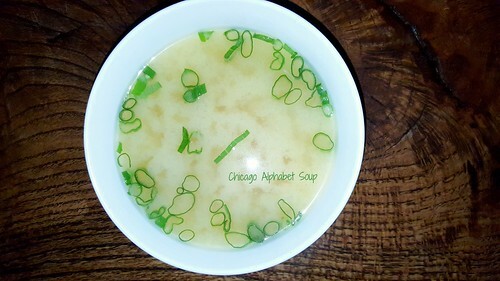 Although I included some American restaurants in my write-ups this year, the following restaurants area reflective of the theme that I created for Chicago Alphabet Soup. So, here are my favourite ethnic jaunts for the year. Roscoe Village is a nice spot for checking out some swanky boutiques, small cafes, and fine dining without “fine dining costs.” After a stroll down the avenue, stop in for some Turkish offerings. Spacious on the inside for several patrons and growling bellies, outdoor seating during the spring and summer, Turquoise Cafe is one of a few Turkish restaurants in Chicago. It is “the best” in Chicago, though. Bucktown is one of Chicago’s premier neighbourhoods. Homeownership, boutiques, and restaurants make up a landscape that result in a constant flow of pedestrians. 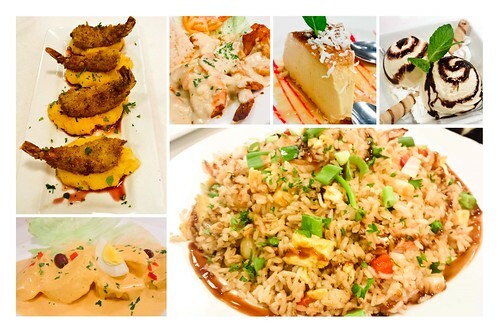 When a lot of those patrons develop appetites, they find seats at Rio’s D’Sudamerica for Peruvian food packed full of wow. Rio’s D’Sudamerica is large on the inside, but unlike most big box restaurants, the food is consistently blooming with Peruvian flavour. A clear indication is the constant influx of Peruvians who frequent the restaurant. And with service that does not rush you, trust me when I say that you will be stuffed when you are done. Chicago’s Hyde Park has experienced a renaissance. With that came the addition of an Italian restaurant that deviated from the expected dishes consisting of red sauces and meatballs. 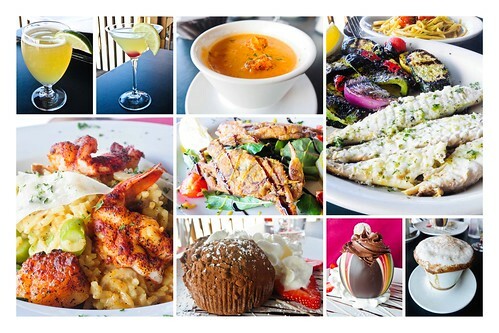 There is a coastal influence to the menu, which means a splendid selection of seafood. The wait staff is engaging, the bar service is phenomenal, and the food is so awesome that you may find yourself making a reservation for a return at least once a month. The menu changes each season, so this is even more of a good reason to make A10 Hyde Park a constant entry on your calendar. There doesn’t appear to be a long list of Romanian restaurants in Chicago. Little Bucharest in Irving Park makes up for that. More like a banquet hall, which allows diners to sit comfortably, this bistro does not shy away from authenticity in the Romanian recipes. 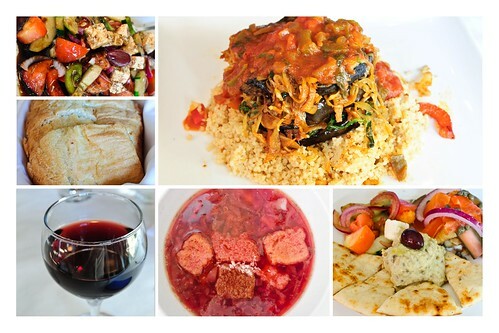 Expect some hearty dishes, as in plentiful in quantity. There are no boiled potatoes and bland meat dishes. Everything has a wow factor. And before you leave, you may get a special christening of an alcoholic spirit. 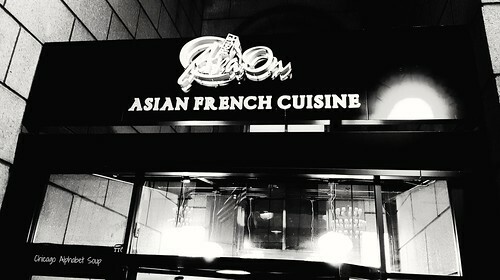 Many restaurants will try to introduce fusion in their cuisine. Some fail. And then there are those like taKO’s KOreanos in Andersonville that get it correct. 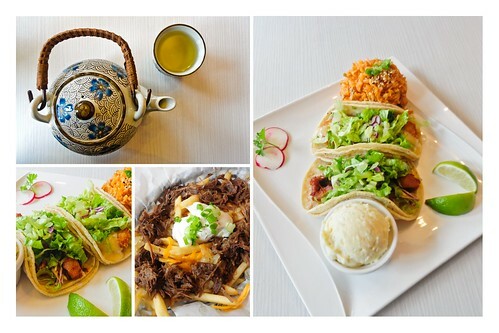 Who would have thought that Mexican and Korean would make for such a fantastic cultural cuisine marriage? 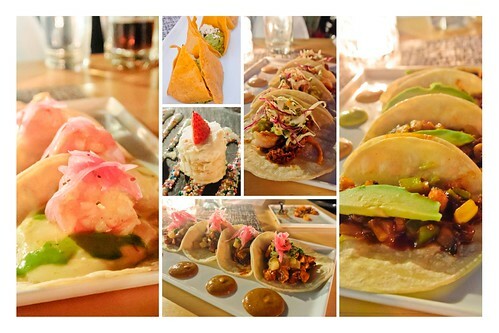 Tacos, enchiladas, and burritos are prepared with Korean accents to the fillings. Having been opened since April with no kinks in the service or output from the kitchen, one would only have to notice the steady stream of customers coming and going to recognize that the fusion dishes are constant draws to those who love a mix of Mexico and Korea. The drive out to Geneva, IL, may be far. I recommend taking the Metra train so that you can go to sleep afterwards. Tacos, tacos, and more tacos, but nothing of the Taco Bell ilk and nothing of the Mexican taqueria brand either. Altiro has cornered the market on creating a variety of tacos that would otherwise be noteworthy entrées without the flour tortillas. Expect to find a bit of Central America and South America in the recipes. I have always thought that French, Italian, and Asian restaurants have the best bar service. Add Altiro to the list. For those who are indecisive, simply tell the server to surprise you and prepare to be pleasantly surprised. The father-son team at LaNotte Caffe & Bar should be taken on the road. Well, their comedy acts should. The food, however, should remain in Berwyn where it is close enough for those in the metropolitan area to get to easily. One may argue that there is a such thing as too many Italian restaurants in the Chicago area. What they can’t say is that they know where the very best Italian restaurants are. 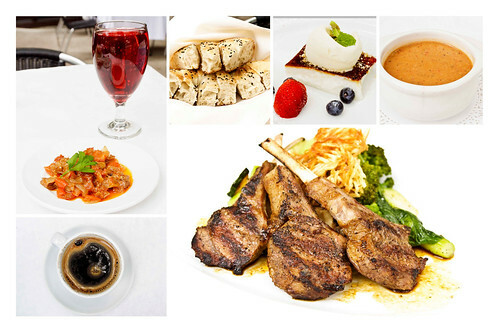 LaNotte Cafe & Bar falls into the category of “must visit.” Food is prepared to order and to specification per the customer. The seafood dishes are my favourite and if you order the sea bass that the father de-bones tableside, then you too will understand why that dish is at the top of my list. One may be able to find Indian, Pakistani, and combination Indo-Pak restaurants throughout Chicago. 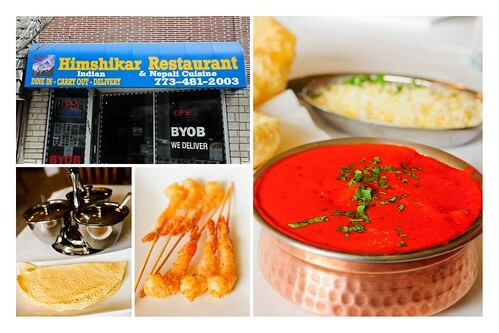 However, for the absolute best Nepali restaurant in Chicago, Himshikar Restaurant in the Sauganash neighbourhood is highly recommended for frequent visits. The food is slow cooked, so it does not come to the table immediately. But never mind that. You can relax or even engage the owners in conversation while the kitchen staff prepares your dishes. Himshikar Restaurant is not a large restaurant, so it makes it easy to engage the staff while trying not to shoot to the moon from such incredibly flavourful Nepali food. And once the food arrives, be ready for culinary excitement. Anyone who has had authentic French food will tell you that not everything is drowned in rich cream. There is also provincial French food, which is very indulgent. Oceanique captures the best of both flavours of France. Moderate in size, this restaurant forgoes the big box effect for authenticity in the dining experience. Coupled with superb bar service and A-list table service, each meal is guaranteed to make you forget that you don’t have to fly all the way to France to have some of the best French food on this side of the Atlantic Ocean. Don’t expect pasta and pizza. 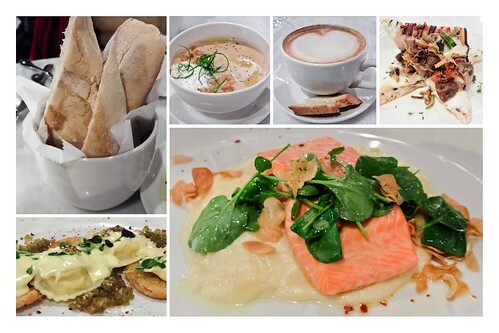 Osteria Langhe serves Italian food that has a bit of a French influence to it. 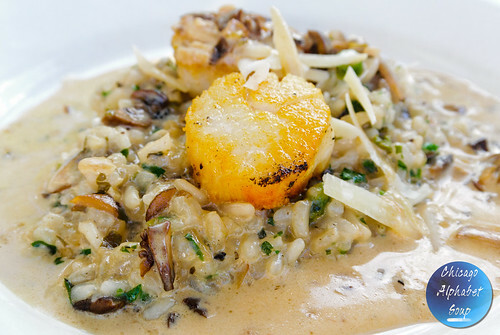 The risotto is the absolute best and the seafood dishes are unparallelled. 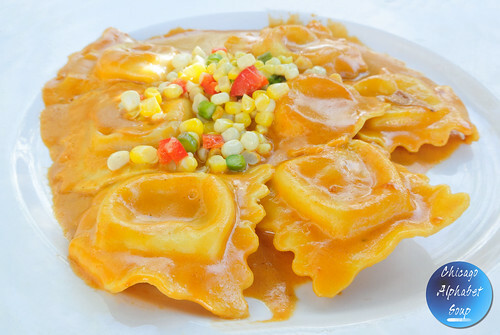 And if you are so inclined to want pasta, the plin is the best in Chicago. 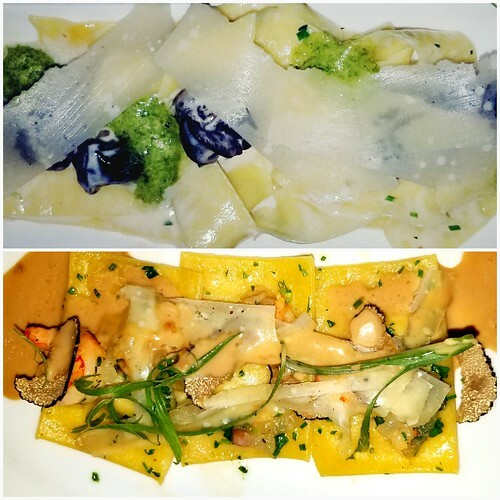 Although the food at Osteria Langhe keeps one returning for more, the atmosphere, splendid bar service, and table service create a feel of going to someone’s home rather than going to an establishment. There is truly an “old country” Italian feel in the middle of cultural hub Logan Square. Chances are by your third visit, you will be on first name basis with the staff. Well, it is at this time that I want to take time to wish a Happy Holidays to all who have been following Chicago Alphabet Soup via the blog, on Facebook, and through my Instagram posts. May the New Year bring you peace, joy, and happiness. And may some server at a restaurant bring you a dish that keeps you returning for more. Until 2015, good eating!